How do you coordinate work with people spread across such wide time zones? That was my first question when I came aboard MartianCraft. At night, I talk with team members who are just starting their day. When I rise the next morning, those same workers are getting ready for their evenings. Likewise we have people who prefer to work late into the night, and others (not many) that like to get an early start on the day. There is no shortage of tools to help with time zone math, whether it is a site like Every Time Zone, an iOS app, or just the info inside of Slack. The problem isn’t figuring an employee’s local time, it’s handing off work, scheduling a (hopefully brief) Skype call, or simply relaying information when half of the team is in bed. The first thing that comes to mind is to keep written schedules. “Jim works from 3p - midnight my time.” Logically, it makes sense. But in practice, that’s a good way to frustrate everyone. It takes away all the flexibility gained with a remote work environment and is an easy way to make your employee sit in front of the screen when they have nothing to do. Instead, I try to determine a common core set of hours. “Sue is almost always available from 4p-6p my time.” Maybe she starts later some days, or knocks off work early other days — but those two hours are almost always the same each day. Determining that small thing provides enough of a window for getting important things communicated. As for those rare people who can’t adhere to regular hours, just asking for a set, two-hour window each work day works well, even if all they’re doing is watching for Slack notifications. Once you have an idea who is in what time zone, and what everyone’s core hours are, it’s time to address the biggest problem in a multi-time zone office: talking about time. There isn’t a day that goes by where I don’t think: Slack why can’t you translate this time based on who is viewing it. Instead, like many people, I bet you find yourself in this trap: “Is that my time, or your time?” That’s easily a 10 minute conversation to get everyone back on the same page. Even then, there is no guarantee that everyone knows exactly when something is supposed to take place.. Instead, I set standard times for things, so that a general assumption can be made by each person. As a company most of our founders are centered in Eastern Time, so we tend to talk as a company about times as if they are all Eastern — or, in the case of Rob Rhyne, we use Rob Standard Time (wherever Rob is, that is the time zone we must talk in). 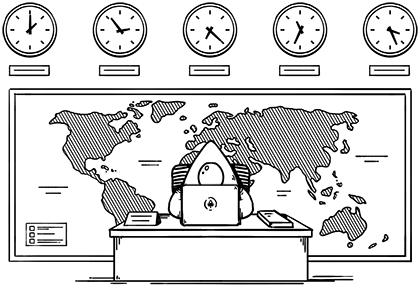 In general, we keep an informal company policy that if no time zone is specified, it is likely Eastern and therefore there is no need to constantly type “Eastern Time” when scheduling. When we are working in smaller teams, for clients, we tend to standardize all talk to that client’s location, not ours. So if we have a client working in Mountain Time, meetings surrounding that project will be expressed within the team as Mountain time. This reduces confusion amongst the team as we can then speak the same time language as our client. This eliminates time-consuming back-and-forth among team members and reduces frustration significantly. The key to working across many time zones is to properly set all of your notifications. It should not be on your teammates to worry about disturbing your rest. Instead, they should be able to ping you all they want, while your setup manages when you should and shouldn’t be bothered. You don’t want to be awoken when a teammate wants to make a joke at your expense, or to just leave you a note for when you get started with your day. You don’t want to miss notes because your team is worried about waking you. All too often we tend to worry about bothering someone when they aren’t working, resulting in conversations like, “Belgium should work on this when they wake up.” Unfortunately, that worker in Belgium isn’t likely to see that message unless the spend an hour scrolling through back chat. You can’t tell team members: if it’s not urgent, don’t send it. That doesn’t work, and your team shouldn’t have to constantly accommodate various schedules. That’s disaster and frustration waiting to happen. Control your notifications; what, when, and how you receive them; and let your team work and speak freely, no matter the time. What I’ve learned since joining MartianCraft is that working across time zones is more manageable than I ever expected. As with all remote working setups, the key is effective communication.